fourteen 3-storey townhouses fronting Oak Street, two 8-storey mid-rise apartment buildings, a 6-storey retirement residence, and a park fronting Knob Hill Drive. This plan is quite a bit different from the original. Before, the developers wanted only townhouses; now, the bulk of the property is given over to apartment buildings. Townhouses front only Oak Street. 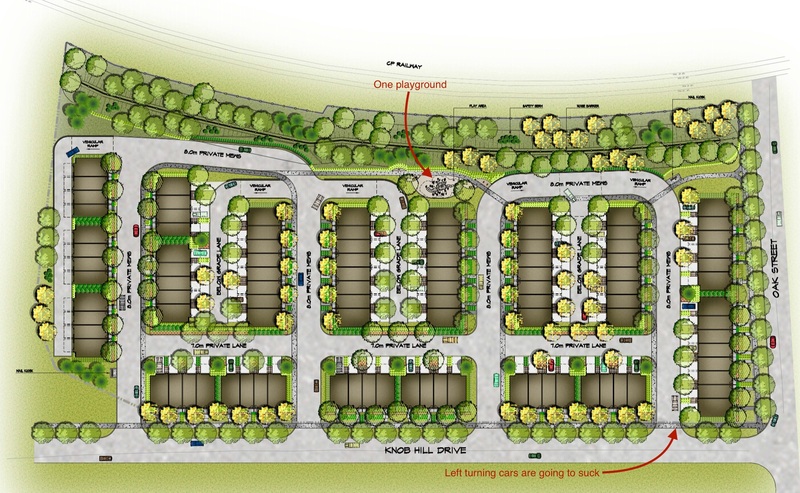 There will be more residents, too: 509 units instead of 99 townhomes. The old plan also had four roads onto Knob Hill Drive. The new plan has only two. Traffic on that road is already occasionally pretty bad; it’s hard to see how this is an improvement. The new plan does include a central park, whereas the old plan had only one out-of-the-way play area. And here do they plan on the children from these homes attending school? As “not in the area” for any school they will be forced into the existing schools which are full already. It seems to me that the city developers need to start looking at this issue as well as what density does to neighbourhoods. lol schools in Weston are not full….this is a good development far better than the 30 storey rental crap being built on John st.
Next Next post: Let’s re-think cars on our streets.